I've just returned from a lovely weekend in the north of Spain; a trip whose main goal was to see Emmy the Great play on Friday night. I'd probably bore you to tears if I went on at length about my musical obsessions (because believe me, once I start it's hard to make me shut up), but let me just say that I had forgotten just how much a concert could make me feel. It was wonderful, and I fell in love with her music all over again. Of course, this weekend trip meant that I had no chance of catching up with anything. I want to apologize for having been such a poor commenter, and responder to comments, in recent times. I know that in all likelihood nobody much notices, and that we all have busy lives, but I always worry about making people feel personally neglected. Paranoid, me?! What happened is that I started working full-time two weeks ago, which is wonderful for many reasons. But it also means that I have to find a new rhythm, develop new habits, and come up with a new way of managing my time. Hopefully I'll be able to do this - last year I was both in school and working part time and I managed just fine - but it'll probably take me some time. I think it has to do with all of that and more. I've always loved the famous Cheris Kramarae and Paula Treichler quote that goes Feminism is the radical notion that women are people too. Anything that affects women can be seen as a feminist issue - anything that involves the interaction of gender and power, really. And there's very little that doesn't. Feminism is much wider than people tend to give it credit for. Yes. Because, as I said above, I believe that women are as fully human as men. And also that the reality we live in still doesn't reflect this fact. Gah, where to even start. Some things have improved, of course, but how much will really depend on which part of the world we're talking about. Even things that most of the Western world has come to think of as basic rights, like the right to vote or to have an education, are by no means rights that every woman enjoys. I think that what makes things so difficult today is that sexism has become more subtle - so much so that people often feel its effects without identifying it as a cause. But let me focus on something that particularly bothers me: sexual double-standards. Whenever I look back on the Victorians, for example, which I do quite a bit in my reading, what surprises me is how much has stayed the same, to be honest. Female sexuality is still demonized. A woman's character, respectability and worth as a human being are still irrevocably linked to how she handles her sexual life in the minds of many. Women are still held to standards of "modesty", whatever that means, that are never applied to men. And there are countless problems that can be traced back to this. And finally, a few people have asked me if I'm going to host the book bloggers Secret Santa swap I hosted the past two years again. Well, a group of wonderfully helpful and dedicated elves has been working behind the scenes ever since the read-a-thon ended, and we should have news for you either tonight or early tomorrow. Meanwhile, as a teaser, here's the lovely button Lenore's very talented husband Daniel designed for us. I hope those of you who celebrate it had a wonderful Halloween. And to those who are starting NaNoWriMo today - good luck!! I'm glad you have fun, Ana. And I'm really looking forward to new challenges, actually. My post for that Unbound one will go up within a week. Awww, that button is the just cutest darn thing!!! LOVED (wish I could make those letters even bigger!) your answers to the meme!!!!! LOVED!!!!! But dammit...I wish you'd join sooner. Because, well, I'm selfish like that, and I'm just dying to see what you might read! :D You know what...my smile's bigger than that too, knowing that you had such a wonderful weekend! The Unbound challenge is awfully tempting, but I'm trying to resist. We'll see how long I hold out for; I've got some books on my TBR that I know would be just perfect for my pool! Fabulous answers to the meme, Ana. I cannot wait to see your list (I can't believe you are making us wait until January)! Speaking of Secret Santa book swaps, do you know that there is a Persephone one occurring? Book Psmith is hosting and I have linked to the details. Congratulations on the full time job! That's great news! I noticed the graphic on the button immediately and just loved it! Amanda: I'm looking forward to new ones too, but at the same time I just want to focus on getting through these until the end of the year! Debi: Well, I could always make a list earlier.... I hope your weekend was lovely too, my dear! Love the button, yes to the swap, can't wait to see your #Unbound list, glad you had fun at the concert, best to you as you learn how to juggle the new schedule, pls visit me often anyway (ha! ), I second that thought of best wishes for fun NaNoWriMO to all participating and just HI! I'm looking forward to the Unbound Challenge...I bought a few books for it yesterday, but I'm hoping to keep my list a bit fluid. I'm sure I'll be hearing about all sorts of wonderful books I'll want to read. I've missed the swap the last couple of years, so I am SO IN this time around! Can't wait to read the news. Congratulations and best of luck with your new job. I personally find that the more I have to do, the more organized and determined I become, and actually get just as much if not more accomplished, so I am hoping this happens to you too! A weekend in Spain does sound oh so romantic and cosmopolitan! I know exactly what you are talking about when you say that a concert can make you feel a certain way. I've left concerts and have experienced a drug-free high for days. And I am totally there on the Christmas swap!! I just recently found out that divorce wasn't legalized in Portugal until about 20 years ago, which really surprised me. I agree with the thing about sexuality--I said the same when I answered the questions, too. Congrats on the new job Ana! I've not been to a concert in ages, I should really remedy that... Glad you loved yours! Your weekend trip sounds lovely and I'm glad that you loved the play so much!!! Hurray on the full time job. I know how hard it is to juggle so many things, you'll find the rhythm that works for you. I love that button and I can't wait for the details!! Ooh, Spain- how fun! And now I am introduced to a new musical artist. I learn so much from your blog, Ana! I haven't filled out the Women Unbound meme yet, but I think your comments are really good, particularly about the subtlety. It's true that maybe women in other countries can't vote or can't file for divorce, or some of those things. But in the western world, women are allowed to do all those things and yet are still subtly marginalized or made to feel unnatural about decisions they make that don't fit with what people think is right. Live music is just so great! It can be at a large concert or in a small club, doesn't matter where. It makes me feel good. Women Unbound..yup..just as soon as I've finished one more challenge. have a good week, Ana. Oh, this has nothing to do with the topic at hand, but I keep meaning to tell you that if your munched copy of Fat Kid Rules the World doesn't come through, I'd be more than happy to send you mine! Send me an e-mail if you want it! toadacious1 at yahoo dot com. Glad you enjoyed your weekend getaway, and congratulations on the new job!! Hope it works out well. That Women Unbound challenge is so tempting, I almost can't stand it. Great answers to the questions. Adjust as you need--you know better than I that Blogworld is a very flexible place! I'm sure you'll be able to adjust to everything in no time, Nymeth! :) And I love that button, it's adorable! Do you know how jealous I am that you can just swing up to northern Spain for a visit? Northern Spain is one of my top 5 favorite places of all time, especially San Sebastián. I went there almost four years ago now with my aunt and have every intention of returning there some day. I'm so jealous!!!! dont feel bad about not being able to comment....i've been so bad lately with that. Great meme! I agree, double standards are infuriating. Especially in this day and age, you'd think we'd be past all that already. I think that was a pretty bookish post. And I'm totally excited about the Santa swap! How fun. I think I'm probably going to join the Women Unbound Challenge. I don't know, though. I agree with you that sexuality is one of the biggest ways women are oppressed. Congrats on your new job! I totally get how a concert makes you feel; we have some Indian classical music concerts in our college and they are heavenly! I Loved your answers to the meme. Maybe I'll sign up; I haven't read any feminist books for a really long time. I'm SO SO SO glad that you had such a great time at the Emmy concert Ana :D I just went and watched the Two Steps Forward video and downloaded the song immediately. Such a beautiful song! And wonderful lyrics. I haven't been to a show in so long :( I miss it so bad. And I'm in love with the Secret Santa button this year!!! It's adorable!!! Congratulations on your full time job, Ana! I'm sure you'll be able to manage well and developing ways to fit it all in (work, blog, read). Love that button! I'm signed up for the swap. So excited about it since I wasn't able to participate last year. Andi: Don't forget to sign up before the 12th! other Jill: I won't say a thing ;) And you know, that does tend to happen to me too! I guess I just need to get adjusted first. J.T. Oldfield: And when I read My Invented Country by Isabel Allende I discovered it's STILL not legal in Chile :/ To get divorced, a couple has to claim to the church that the marriage was never "consummated"...But yeah, Portugal was a fascist state until only a decade before I was born, and in many ways we're still behind. There's a LONG way to go. Staci: Concert :P But yes, I did. Thank you for the good wishes, and I hope you join the holiday swap! Aarti: You're most welcome :D I love spreading the word about things I love, be they books or bands. And I completely agree with you! Can't wait to see your answers to the meme. Gavin: It makes me feel good too :) I was a regular concert-goer until only a few years ago - now, because most shows require me to travel, I don't quite have the leisure anymore, but they remain among my very favourite things. Thank you, and I hope you're having a good week too! Megan: Awww, you're too sweet! You know, shortly after I left you that comment I realized I'd mixed it up with King Dork in my head! I cancelled King Dork because it'd been months and the owner didn't respond to e-mails, but Fat Kid Rules the World is coming via a Bookmooch Angel who's only waiting for one more book to arrive. Thank you anyway, though!! Congratulations on the new job! I hope that you will really like it, and don't worry about not commenting so much, real life takes precedence sometimes! 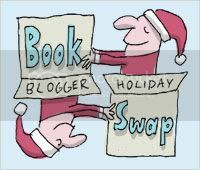 And yay, for the book swap, I'm off to visit the blog now! Melody: I hope you do! Then you'd cross the border and come see me, right? ;) Very happy you're joining the swap again, btw! Joanna, you're too sweet :D And I hope you join the swap! I am late in response to these post but here I am never the less. Your words around this meme for this challenge are perfect... now off to check out your book list!